We’ll make your child’s birthday party carefree . . . leave the planning, the fuss and the muss to us! The Mad Hatter pours tea for me! The birthday child will be Alice. 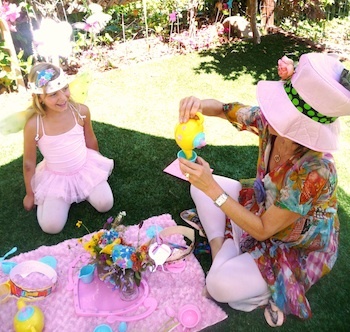 She and her and guests will perform The Mad Hatter’s Tea Party from Alice in Wonderland in tea party clothes and costumes from the characters in Alice. An additional 30 minutes of organized playing and fun for a total of 2 hours of fabulous party time. The birthday child and guests will perform fantasy filled portions of The Nutcracker with tutus and sashes and nutcrackers. Am I doing my tundu right?